Click the button below to add the IQ7PLUS-72-US Enphase IQ7PLUS - 72 Cell module Inverter - 240VAC to your wish list. 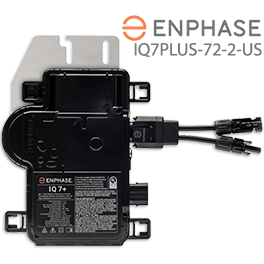 The Enphase IQ7PLUS-72-2-US is designed for modern grid-tied solar PV systems using 60-cell or 72-cell solar panels connected to 240 VAC utility power. Enphase's seventh-generation microinverters are powered by their unique software-defined architecture with an efficient design. The IQ7PLUS-72-2-US Micro produces 4% more power, and is 19% lighter and 17% smaller than the IQ 6 series. The IQ 7 continues to offer the same ease of installation with the revolutionary 2-wire Q-Cable . It also leverages semiconductor integration for higher reliability and better economies of scale. Part of the Enphase IQ System, IQ 7+ Micro inverters integrate seamlessly with the Enphase IQ Envoy™, Enphase Q Aggregator™, Enphase IQ Battery™, and the Enphase Enlighten™ monitoring and analysis software. The IQ7PLUS-72-2-US Microinverter extends the reliability standards set forth by previous generations and has over a million hours of power-on testing. This thorough testing of proven solid-state technology enables Enphase to have the confidence to provide an industry-leading warranty of up to 25 years. Designed for 240 VAC, 60-Cell & 72-Cell solar panel systems.